During 17/18 season we started the not insignificant process of moving TWRFC membership management & payments onto the RFU Game Management System (GMS). Whilst there were the few inevitable teething challenges, in 2017 – all 1299 family members completing their registration process and payment directly via GMS. This season 18/19 we are hoping that it will run even more smoothly and we will also be migrating the remaining membership categories (Senior Players, and Vice President) onto GMS. Whilst GMS is certainly not perfect, it has the benefit to the club that our RFU records are automatically updated (something we are now obliged to do as part of our accreditation), and provides us with a central record of membership, and membership payments. This is very helpful to us as a club meeting our GDPR obligations. Go to GMS & log in. You have a GMS account, it is already associated with TWRFC and you know the username/password. Great! – go to the next step. You do not have a GMS account yet. You can create one yourself via the ‘Create Account’ button and proceed. This is automatically associated with TWRFC. This will give you the opportunity to create records for any other adults/juniors in your family – and request to register the juniors as age-grade players. There’s a guide from the RFU how to do so here. 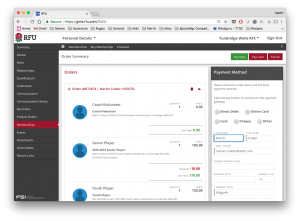 Once the account(s) are created, you can proceed to the next step and purchase membership. You have a GMS account (e.g. from englandrugby.com, or another club) but it isn’t associated with TWRFC Frustratingly, you are unable to resolve this without help, an admin will need to search for your account and add you to TWRFC. Please submit a request for help containing the following data: RFU ID (if known), FIRST NAME, LAST NAME, EMAIL, DATE OF BIRTH, ADDRESS, POSTCODE. You have forgotten your username You can send yourself a username reminder via the RFU password recovery page. You have forgotten your password Reset your password via the ‘Forgot Password’ button, and proceed. This will send a password reset link to the email address stored in GMS. If you don’t receive the reset email, please check your spam folder, and if necessary submit a request for help. 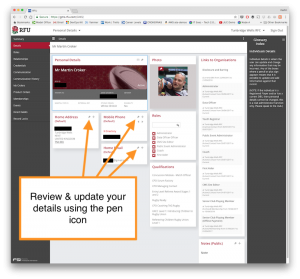 From the Details tab – please review, and update your personal details as necessary, in particular we would ask that you ensure the email address within GMS is accurate. Note – Some details for registered players or DBS cleared coaches, require admin support to change (please submit a request for help). …otherwise, you need to make sure that everybody you are purchasing membership for has a GMS record, and that their record is associated to yours. You can see all records related to you from the Relationships tab. Please also validate their details (as you did for yourself in the previous step). 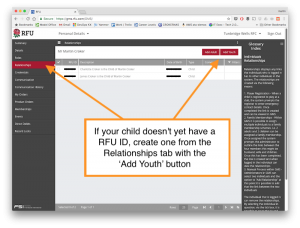 If your child doesn’t yet have a RFU ID, you can create one for them from the Relationships tab using the Add youth button. Whilst it’s not necessary, you can do likewise for your partner using the Add Adult button. If your child has an existing RFU ID which isn’t related to yours, you will need submit a request for help in order for one of the club administrators to associate the records. To purchase membership, select the Membership tab, and click Buy Membership. 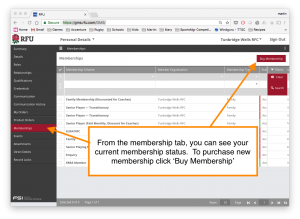 Note – sometimes the button on the Membership tab is shy – in this case you can always find it on the Summary tab. This will present you a list of family members. Select each family member and select the appropriate membership for them. You will only be charged for the first family membership you purchase. If you cannot see a family member, you can add them using the buttons at the top… do not complete the purchase until all family members are added to the order. If you can only see the option for youth player – when you were expecting adult membership. The most likely answer is that either your DOB is wrong, or missing. Click the details tab and enter your DOB, or if you prefer ’01/01/1900′. Add the membership category of “Coach/Volunteer” IN ADDITION TO either “Senior Player” or “Parent/Guardian” to apply your £10 discount. If you do not see this – you are missing the relevant role. It’s a lot less work for me if you contact me now, rather than me having to unwind the order later. Coaches & Team Managers – Must also hold a valid DBS whilst coaching for TWRFC, if you have any questions please contact safeguarding@twrfc.com. To qualify, coaches must additionally have completed your Rugby Ready course (or be committed to complete Rugby Ready prior to the end of October 2018). If you don’t see this membership option but feel you should qualify – please let me know and I will resolve. Halo Gym payments will continue to be made via GoCardless… (at least for now).